Here’s Dillon, an armadillo brawler starring in what is sort of a Nintendo take on Mad Max. Maybe you’re waiting for more Zelda or Animal Crossing, but I tend to get the most excited for Nintendo’s stranger, less well-known games. Their new one is pretty strange. It’s called Dillon’s Dead-Heat Breakers and is actually the third game in a 3DS series that launched in 2012 with Dillon’s Rolling Western, establishing the titular armadillo as a bona fide Nintendo mascot. Did you even know he had one game, let alone three? You only play as Dillon in half of the game, and as an animal version of your Mii avatar for the other half. Anytime it’s night, you play as Dillon in a mash-up of tower defense, third-person brawling and—new to this sequel—combat driving. During the day, your Mii takes over, a Mii that at the beginning of the game is morphed into an animal version of itself. (My Mii of me became a bidpedal bull that wears a jacket and no pants). When you’re playing as your Mii, Dillon won’t talk to you. He hangs around and glowers, leaving his chirpy squirrel pal Russ does all the talking. During the daytime parts of the game, you have to make money, which you can do by working at a recycling plant, playing an in-game pseudo-VR arcade game, or by tending the shop of a lazy bear. If you take the shop option, you must try to sell things like fish nuggets while leveling up your sales acumen and upgrading the name of the shop from “Zzz Shop” to “So-So Shop” to who knows what comes next. 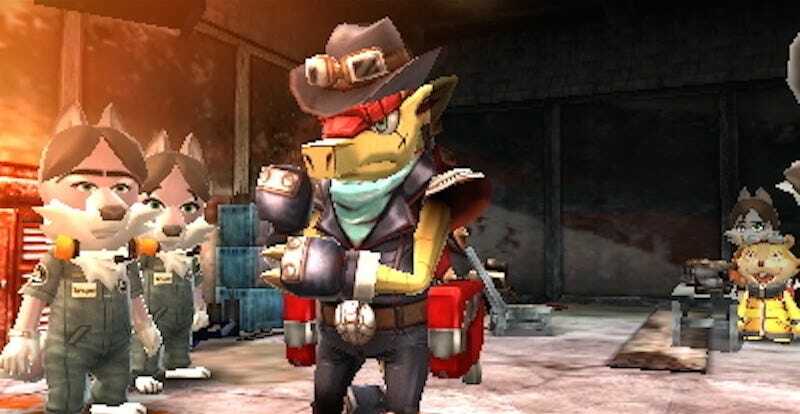 This is indeed a post-apocalyptic Nintendo game starring cute but heavily armed animals. There was a disaster. Most of the world is wrecked. The game’s central city is a walled-in, trash-strewn mess. People are desperate for work and food. A lot of them seem sad. Gameplay follows a cycle. You make money playing mini-games by day. Then you’re usually told that a mayor of some nearby town needs help to fend off an invading army of evil Grock monsters. You head to a hotel waiting area, which is filled with Miis-turned-animals who are all hired guns. You then talk to these Miis, many of whom are pulled from your own 3DS system, and decide if they’re powerful enough to pay to fight alongside you. I’ve been taking animal versions of my wife, father, and children into most of these fights. Dillon using his rolling attack against Grocks while a Mii shoots a rifle for an assist. Once you get to the town you need to defend, you play as Dillon, first assigning the Mii mercs to gun towers and then scouring the landscape for loot. Eventually, Grocks appear. They mostly drop from the sky. The mercenaries can shoot at them, but you’re also expected to attack them as Dillon. His main moves involve rolling into enemies and then either grinding into them or swiping his claws at them. You can’t control your own main Mii during these fights, but he or she can be dispatched to jetpack his way across the map to fight other enemies. A lot of this is new to the sequel: the home city, the mercs and more. The tower defense was sort of there before, as were Dillon’s moves. But it’s a brand-new idea that at some point during their assault, the Grocks will transform into cars and begin driving in a circuit on roads that belt the outskirts of the city. Apparently all this driving is revving them up for a final assault. At this point, you, as Dillon, roll after them and attack them while driving. It’s very Mad Max. Sure, that’s what those round things were. But... is that mole secretly from Animal Crossing? There’s a mole back in the main city who wears overalls and a hard hat and therefore may or may not be Resetti (is this whole game secretly about what would happen if a disaster struck Animal Crossing??). He’s called Weldon in this game. You sell him stuff and he helps you build some sort of ultimate weapon. Weldon has weird ideas about the treasures from the past that Dillon finds and wants to sell to him. Dillion finds a roll of toilet paper, and Weldon tells him it was a pillow. Dillon find a traffic cone, and Weldon explains that it was a claw of a creature that used to lurk underneath parking lots and attack people. He confidently describes a stack of CDs as a pre-disaster snackfood that was calcified during the cataclysm. This post-apocalyptic Nintendo game includes a bartender who mixes drinks that give your Mii-turned-animal a health boost. Naturally. In the home base city, there’s a bar tended by a scratchy-voiced goat bartender. He somberly serves your Mii drinks that raise your health. Each drink has a backstory about how it was made while listening to classical music or with rainwater and mint or something. There’s also a farm in town, and lots of animal people just hanging out saying weird stuff about how many stairs are in the hotel or how they have a crush on you or love Dillon or are in a bad mood or whatever. They’re chatty.